Our guild is thrilled to be hosting Latifah Saafir for a weekend of fun events! Latifah is coming all the way from California to share her modern and innovative quilting techniques with us. Latifah will be speaking about “Being True to Your Inner Artist”, an exploration of tips and insights to tapping into your own voice as a quilter. We will learn practical techniques on how to tune into ourselves and trust our instincts and visions. Doors open at 6:30, lecture starts at 7:00 until 9:00. Members tickets are free but space is limited. Sign up here! Guests are always welcome with a $5 ticket purchased in our store. Come and learn how to make this modern quilt designed in homage to the classic pickled beets motif. Get ready for paper piecing and curves! Tickets are $70 and available to MEMBERS ONLY until July 5th when we will make them available to guests. So get your ticket NOW! Doors open at 9:30, class starts promptly at 10:00 am until 4:00 pm. Bring your own lunch. This workshop is being held at Patch Reef Community Center. A supply list is available on the Events Page. The pattern for this class is not available yet, but will be ready for purchase the day of the class for $10. So don't forget to bring your money! 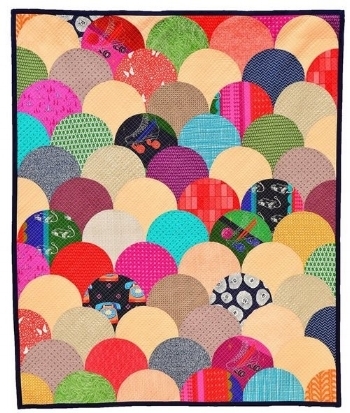 Who doesn't love this giant clam shell quilt?! Come learn how to piece it with your machine in any size clam shell that you want! Tickets are $70 and available to MEMBERS ONLY until July 5th when we will make them available to guests. So get your ticket NOW! Class starts promptly at 10:00 am until 4:00 pm. Bring your own lunch. This workshop is being held at Sugar Sand Park Community Center. Check out the supply list on our event for more details. The pattern and templates for this class are available on Latifah’s website and she is offering a 20% discount for our members. Just enter code SFMQG at checkout. You can choose whichever template size you’d like. We look forward to seeing you at these exciting events! If you have any questions, please contact Andrea at events@southfloridamqg.com.